A. 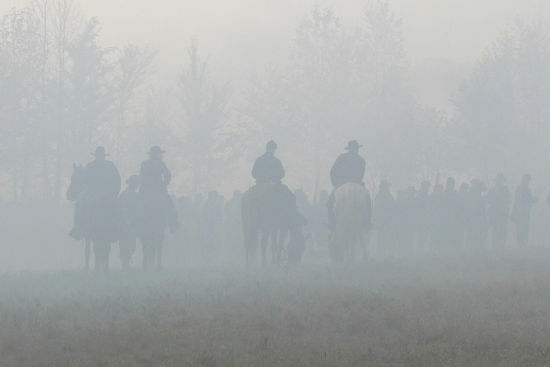 Quick Look at…The Fog of War and Silent Battle « The Turner Brigade--Missouri Volunteers, U.S. They assembled in the dark and marched out before dawn. Saturday’s sun rose over a landscape shrouded in acrid clouds of smoke so dense, the Union infantry could not see the enemy fifty yards away. All they could do was watch for the orange flare of musket volley and return fire. 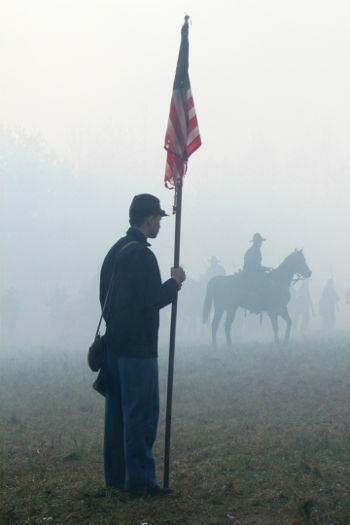 The fog of war seemed to transport Turner Brigade members back in time, to Fraley’s Field near Pittsburg Landing 150 years ago, allowing a better understanding of what the Civil War soldier saw and heard and felt. Black powder smoke was a soldier’s friend and enemy, hiding him at the same time it obscured his vision. It made it hard to tell friend from foe and set the stage for the tragedy of friendly fire, which might be averted if identification could be determined by familiar bugle calls or battle flags that pierced the gray smoke ceiling. For observers, a battle was a terrible wonder to behold—and a surreal experience when the battle was silent. Acoustic shadow, it is called, when sound waves are bent, absorbed, or refracted by factors such as winds aloft, temperature gradients at different altitudes, snow, vegetation and terrain. Acoustic shadow (“silent battle”) happened in the eastern and western theaters, on land and sea, and the judgments that commanders based on sensory perceptions changed the course of battles, careers, and history. Acoustic shadow kept Confederate General Joseph Johnston from sending reinforcements at the Battle of Seven Pines on May 31, 1862. He had planned to move when he heard Hill’s troops engage, but he never heard their gunfire two miles away—although the battle was heard ten miles away in Richmond. Later that day, Johnston would be severely wounded, and the command of the Confederate army would go to Robert E. Lee. At both Port Royal (November 1861) and Gettysburg (July 1863), the ripples of acoustic shadow caused a pocket of silence close to the action yet carried the sounds of battle 150 miles away. Witnesses to the March 1862 action between the Monitor and the Virginia watched the fierce naval battle from the shore—but heard nothing. Incidents of acoustic shadow are reported at Fort Donelson (February 1861), Iuka (Sept 1862), Perryville (October 1862), Chancellorsville (May 1863), but it was April Fool’s Day 1865 when two Confederate major generals left their commands to attend a shad bake hosted by Brigadier General George Thomas Rosser. Acoustic shadow allowed George Pickett and Fitzhugh Lee to enjoy their outing, blissfully unaware that a mile and a half away at Five Forks, General Philip Sheridan was tearing up the Rebel right flank. Confederate losses (including A. P. Hill’s death on April 2) would force the evacuation of Petersburg and Richmond and lead to Lee’s surrender at Appomattox Court House. Garrison, Webb with Cheryl Garrison. The Encyclopedia of Civil War Usage—An Illustrated Compendium of the Everyday Language of Soldiers and Civilians. New York, NY: Castle Books, 2009. Norris, David A. “Acoustic Shadows,” Encyclopedia of the American Civil War—A Political, Social, and Military History; David S. Heidler and Jeanne T. Heidler, editors. New York NY: W. W. Norton & Company, 2000. Ross, Charles D. Civil War Acoustic Shadows. White Mane Publishing Co., 2001. This article was originally published in the May 2012 issue of The Shrapnel, the newsletter of the Turner Brigade. For information about The Shrapnel, contact Capt. Randy Baehr, Editor.